With the new AIO system AMK offers a modular I/O design that ensures fast commissioning and intuitive handling. 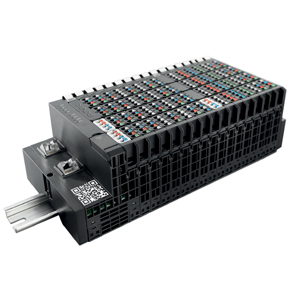 Suitable for all AMK systems, these reliable I/O modules provide easy, fast, and tool-free installation. The “PUSH IN” direct connection system saves time and minimizes errors. The high-speed system bus reaches up to 256 digital I/O’s in 20 μs. AIO features extremely fast response time, fast addressability, and precise mapping of processes in the plant with up to 1024 I/O channels per station as well as large performance reserves for future expansions.